Aqua Studio - 3 Nights or More Aqua Studio has king bed, single bed with trundle and a pull out double sofa bed (children), sleeps 6 comfortably. Earth Studio - 3 Nights or More Earth Studio has a king bed, single bed & a huge lounge which extra people can camp on. Heritage Studio - 3 Nights or More Heritage Studio has a king bed with pull out double sofa bed (children). Aqua Studio has king bed, single bed with trundle and a pull out double sofa bed (children), sleeps 6 comfortably. Earth Studio has a king bed, single bed & a huge lounge which extra people can camp on. We have tastefully decorated connecting suites for families and groups, special featured suites for people with disabilities, or deluxe suite for that romantic stay. A candle lit dinner under the magnificent stars can be arranged by request when booking. Accommodation in Bulwarra's delightful rural Bed & Breakfast comprises of spacious and luxuriously appointed suites, set in a beautiful rural setting, equipped with all the facilities required to ensure a very pleasant stay. We will not only provide you with a fantastic experience and accommodation, we will happily help you every step of the way in creating that special holiday and making sure your stay is one that you cherish forever. We can help organize your itinerary while you are in the Central West. Settle down after arriving or touring the area to a quiet drink under the trees and enjoy our magnificent 360º views of rural Australia. Of a night, lay on a rug under the stars (Observatory location in 'Places of Interest' for the technical night observers) which are finer then most have ever seen. Enjoy the summer nights and the absolute quiet of rural setting which most have never heard. Animal meal packs can be bought (50 cents each honor system) for the chooks, ducks, lambs, calves and any other animal in the menagerie there on the day. You may even see wild king parrots, kangaroos, kookaburras, kingfishers, echidna or any number of other wild life which frequent the our home grounds. Breakfast maybe typical Aussie eggs, bacon or sausage, tomato, mushrooms and corn or a lighter Judy's special, fresh fruit smoothie (a kid's favourite) that will give you the energy for your big day out. 1. Heritage Studio (red wall in photo on website) has a king bed with pull out double sofa bed (children), sleeps 4 comfortably. 2. Aqua Studio (aqua wall in photos on website) has king bed, single bed with trundle and a pull out double sofa bed (children), sleeps 6 comfortably. 3. Earth Studio (beige wall in photos on website) has a king bed, single bed & a huge lounge which extra people can camp on, sleeps 5. There are king single fold up beds which can be added to all studios. There are stairs off the veranda (6 burner BBQ, table & chairs) to come to the garden, games room, alfresco area (wood pizza oven, BBQ, oven & open fire), main house with communal fully equipped kitchen (gas plates) and formal lounge/dining room. The paddocks are rocky and uneven with many native grasses growing with sheep and cattle grazing. Extra-person charges may apply and vary depending on hotel policy. -Government-issued photo identification and a credit card or cash deposit are required at check-in for incidental charges. Special requests are subject to availability upon check-in and may incur additional charges. Special requests cannot be guaranteed. Special check-in instructions: Check-in time starts at 1400hrs. Check-in is available from 2.00pm onwards. Please contact Bulwarra Bed & Breakfast when you are approximately 1 hour out of Dubbo to ensure I am here to welcome you. Contact number is provided on confirmation. Business hours 9.00am-9.00pm. Check-out time is 1030hrs. Well behaved animals are welcome and we have facilities for most animals. Ask about our concession card/aged card holder discounts or group bookings. RV's are most welcome as our parking area is large. We can arrange transport to and from the airport for a small fee of $20 per car. 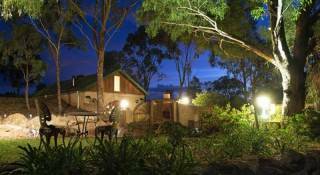 -Long weekends you will need to book for a minimum 3 nights. Cancellation Policy Unfortunately any cancellations will need 72 hours prior notice to booked date or a cancellation fee (30% of booked total) will be charged. If coming south and through Dubbo, from the zoo entrance travel about 9 km along Obley Road toward Yeoval. Benolong Road is on the left. Travel 2.2km along Benolong Road and turn right into Bulwarra Drive. Travel 1.3km and driveway is on the left going up the hill. If travelling north & coming from Molong, take the Cumnock/Yeoval turn off just coming out of Molong. Turn left onto the Banjo Paterson Way/Obley Road and travel about 45 minutes, and after going through Toongi (it is tiny so don't miss it) you will see Benolong Road on the right of a large bend.